Stockholm (AP) — In search of a new and different vacation spot, with great food and cultural delights? Look no further. The event shows off the best of the race’s culture, including opera, martial arts and culinary delights such as Gagh — a delicacy of well-seasoned live worms — and blood wine. 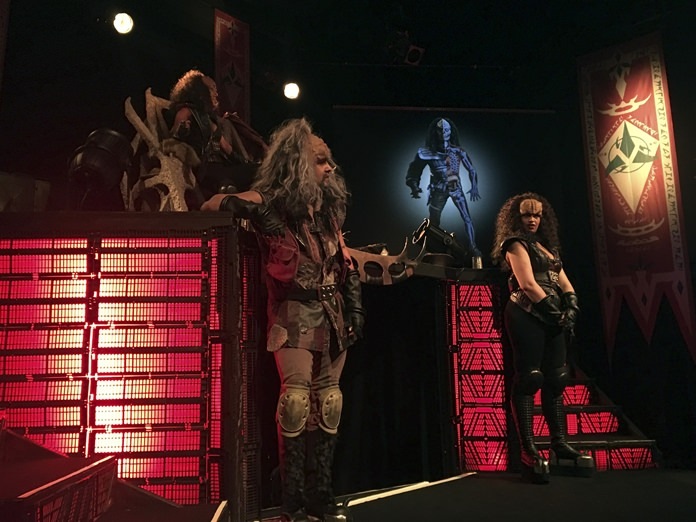 Along with a stage presentation — offered four times a week in English and Klingon — the lobby of the Turteatern has displays offering vacation packages to Qo’nos, extolling the merits of Klingon culinary tours (“the best kept secret of the Beta Quadrant”), and seeking to attract students to courses at the military academy (“find your inner warrior in outer space”). Star Trek fans were out in force earlier this month for the show’s premiere, eager for first contact with Klingons. “I think it was a really good show,” said Urban Andersson, chairman of the Stockholm Trekkers association, dressed in his Star Fleet uniform. Many fans were relieved to see that the visitors from Qo’nos resembled the Klingons from the 1990s “Star Trek: The Next Generation,” rather than from “Star Trek: Discovery,” the latest installment produced by CBS. “They are exactly the way I expected them to be,” said Snoret Linden, dressed as a Star Fleet ‘Trill,’ a humanoid species from the planet Trill. It was a point stressed by the Klingons themselves, who had a message for Quentin Tarantino, director of the upcoming “Star Trek” movie. “We have seen Discovery. We do not approve of this malicious portrayal of Klingons,” said Ambassador Ban’Shee of the House of Duras. Next articleFacebook’s ‘fixes’- meaningful or just skin deep?